Tailor-made courses right for you! The e-learning space has changed rapidly over the past two decades. No longer are participants kept engaged in the learning process by simply reading a 100-page printed manual. To stay relevant, you need to create high quality HTML5 compliant courses that are adaptive to your business’s training needs. That’s where the CourseSuite team come in. Utilising the latest coding frameworks and practices, we’ll work with you to ensure your content is SCORM compliant to integrate with supported LMS. Creating quality e-Learning content that addresses all employees in any location, at any time. Get to know: Initial meeting sets the tone and gives us an understanding to the personality of your company and its goals. Take stock: We take stock of existing learning and training materials, be it in paper/CDs/other media. Get the expert: We talk to subject matter experts to curate and create content suited for your business. Build: We build an engaging learning experience through sound instructional design. Assemble: We assemble the custom courses in a SCORM compliant format. Brand: We produce output that matches your organisational branding. Be a ninja in the know, receive product updates and news straight to your inbox. Learning in a rapid time frame..
Our great team helped a new client build over 60 courses in just 2 weeks as they were migrating. Fully interactive, complex interactions, powerful completions rules, stunning graphics. Built in our own software, allowing us to be more reactive to your needs. 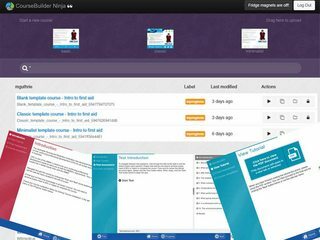 Need a rapid, affordable, no frills course built - or need to prototype a course? Using our tools, we can convert your content into a course for a fraction of the cost of others. Courses start from $ 499 (AUD, plus GST). Our experienced development team have built many Articulate courses. We design courses to be suitable to your subject matter and target audience. We've also built up a library of prebuilt behaviours and coding snippets allowing us to pass on efficiencies to you. We have built and implemented courses in many learning systems and can bring you our experience and skills. From consultancy, development, implementation and support, we are here help. We’re an award winning, innovative e-learning development company with many years of experience. No job is too big or too small for our dedicated team. Our advanced programmers, graphic artists and instructional design specialists are all within an arm's reach and here to help transform your content into a modern eLearning solution. Cost effective without compromising quality. We are secure and can provide signed legal non-disclosure agreements to protect your content IP. Many years of experience working with business of all sizes, small is also beautiful for us! We work closely with you to make it a personal experience. We assist organisations with all their e-Learning course development projects - from individual courses to a customised learning environment for their employees. The team at CourseSuite provided us with what we needed to offer our courses via a distance learning mode. They have provided us with products that we are proud of. We engaged the guys to help build many courses for us. We were so happy with the output that we subscribe, are now making our own courses and have been for 2 years. Go team, Great Courses, Great Apps! The new quiz builder is great. Initially CourseSuite built us some great course templates as we were migrating to another system and we used them to make over 85 courses. They supported us all the way through and we're now long term subscribers.